Replica Team Shirt, you’re having a larf mate, no, the nearest thing was not available from the tiny Cub Shop but Alf Mancini’s in the Palace Road, there was no sign of a Club badge on those either! For the Cup Final we all bought the Mancini nylon Red and Black striped version of that season’s away shirt, no club badge or any form of embellishment, nylon and nasty! I've still got mine, it’d fit a ten year old now, I think my waistline is a bit bigger now.! 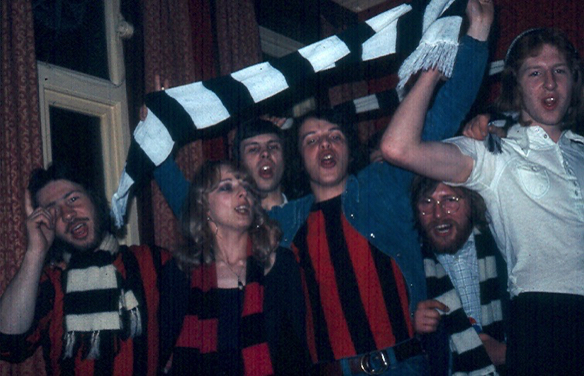 right: a few of the faithful on the evening of the Cup Final after arriving back from Wembley via one or two hostelries, to the Lord Napier, Mortlake, in order drown collective sorrows, weirdly we ‘celebrated’ all night. Those were the days! Back then, Open really meant that, virtualy no access denied. Somewhere in the archive are more shots I took at this end of season event, some from the television gantry under the roof of the Riverside Stand. 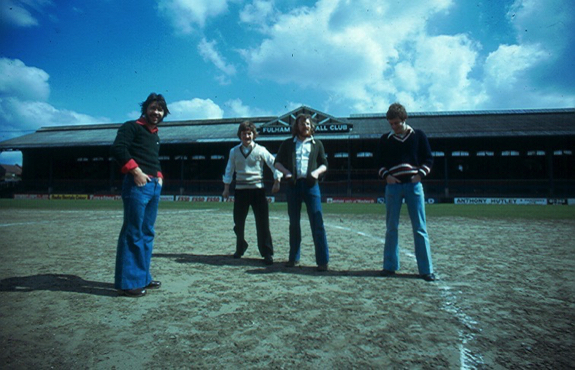 Somehow, I can't see the likes of us being allowed on the pitch these days, let alone up there, talking of the pitch, just look at the state of the mud after a typical season! Luckily for you, as I was always the one carrying a camera everywhere, my fizzog rarely appears so i'm behinf the lens this time too.